We pound on the wooden door for a third time and push it open cautiously. Irina Maksimovitch sits ten feet away from the door, doing dishes at the kitchen sink. She gives us the condescending and angry look of an aristocrat expecting better service. â€œWhy you didnâ€™t open the door earlier? Food for me?â€ she asks in a thick Russian accent. I bend down to the delivery bag to pick out her food boxes. It is labeled, â€œlow fats and sugar.â€ Her eyes dart back and forth behind the big spectacles, glancing at the Styrofoam boxes in my hands and then at my face. Something seems to strike her. She turns her kitchen stool around, breathing heavily. â€œAre you Japanese?â€ she asks in a thick Russian accent. â€œI am Chinese,â€ I say, smiling. A smile erupts on her face, and she starts telling me, a stranger, the story of her life. She used to be a geologist in Russia, but after immigrating to the U.S. in her early marriage years, her professional skills could no longer help her achieve the American Dream. Now, at the age of 74, she lives alone in a low-income senior building in Evanston. Irina says she has a long lost friend in Shanghai and asks if I can help her find him. I donâ€™t know if he survived the Cultural Revolution, she adds. I ask her how they met, but she pushes my questions aside. She has a more important thing to share: their song. She sings me a Communist song that her friend taught her. Her voice, shaky and out of tune, is still an eager display of a highly valued friendship. At the end of our first meeting, which lasted for about 20 minutes, I was moved to tears by Irinaâ€™s stories, words and songs. I had no idea why this elderly woman trusted me, but my heart went out to her anyway. I saw Irina as a poor immigrant woman withering in a system of neglect, and my heart was aflame with anger for the mistreatment she had received for just not being young and American. All the ideals in my heart seemed to come alive. I felt that it was wrong to receive a privileged education and at the same time withhold my resources, care and time from the needy around me. I was determined to return to Irina, even if just to deliver a food box or to have another short conversation that would brighten her day. My fleeting feelings did not translate into action. I did not go back the next week, or the next, or the next. Irina called me and left countless messages in my inbox, asking for a visit. The eagerness in my heart gradually turned into irritation, but my guilty conscience drove me to return after one month. 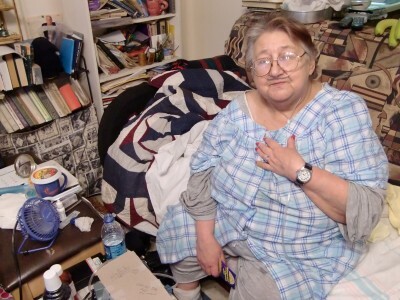 Irinaâ€™s nurse was there to fix her breathing machine. I played the piano and sang for her while the machine hummed gently in the background. I almost scoffed. I did not need money. I smiled politely, made some promises, knowing that they would prove empty, and left. She kept calling and leaving messages. Gradually, I learned to ignore the pleas and justify my hardhearted decisions. I also realized that I had no reason to be angry with anyone other than myself for the brokenness of the world. I saw that I, too, was part of the system of neglect, part of the reason why Irina could not find joy in living, and part of the teeming masses that were busily and selfishly chasing the allure of the American Dream. I still have not gone back.